I adapted this recipe to meet some random cravings I was having as well as to add protein and to make it vegetarian. Heat the olive oil over medium heat. Add the onions and sautee them until transparent. 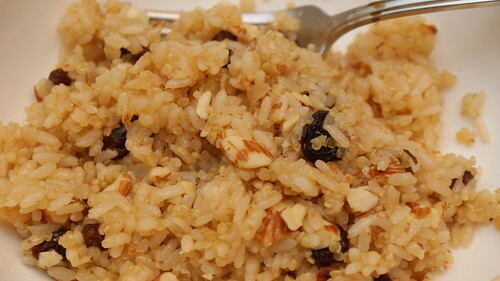 Stir in rice, quinoa, raisins and broth. Bring to a boil. Reduce heat to low and simmer for 15-20 minutes until the rice and quinoa are cooked through. Stir in the almonds before serving. I have never made quinoa...but think I need to! This recipe looks good. It is so easy and so good for you. I've read it is considered a perfect protein. We're vegetarian so it is a staple in our house. I buy it in the bulk section at the grocery store or at Costco. A little goes a long way.